After more than 20 years studying film and costume design history, 10 years curating vintage clothing, and years working in LA's Fashion District, Kimberly Truhler is an author, Professor, and preservationist of the HISTORY OF FASHION IN FILM. In 2009, Kimberly founded GlamAmor and has since contributed hundreds of articles on iconic costume design and its influence on fashion today. She teaches the HISTORY OF FASHION IN FILM 1920s-1980s as Professor at Woodbury University as well as a frequent guest presenter around Southern California. Due to her knowledge and experience, Kimberly is a highly respected expert for companies such as Turner Classic Movies (TCM), Sony Pictures, Christie's auction house., Elle magazine, and the Fashion Institute of Design & Merchandising (FIDM). A book is currently in the works based on her series The Style Essentials. 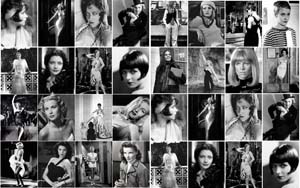 THE STYLE ESSENTIALS: HISTORY OF FASHION IN FILM 1920s-1970s is an online webinar series created for those who are not able to attend my class or presentations in person. There will be one webinar per decade. Each presentation includes live video of me discussing the film history, costumes, costume and fashion designers, and fascinating backstories of the stars alongside stills from the movies and images that show the influence on fashion today. The Style Essentials represent iconic costume design in the movies that immediately impacted fashion and continues to influence the industry today. This is a LIVE WEBINAR series of the HISTORY OF FASHION IN FILM course I teach at Woodbury University and in presentations around Southern California. There will be one webinar per decade from the 1920s to the 1970s. This online class will focus on the style icons from Hollywood during the 1970s--such as ALI MACGRAW, FAYE DUNAWAY, and DIANE KEATON. Each presentation includes live video of me discussing the film history, costumes, costume and fashion designers, and fascinating backstories of the stars alongside stills from the movies and images that show the influence on fashion today. The Style Essentials represent iconic costume design in the movies that immediately impacted fashion and continues to influence the industry today. This is a LIVE WEBINAR series of the HISTORY OF FASHION IN FILM course I teach at Woodbury University and in presentations around Southern California. There will be one webinar per decade from the 1920s to the 1970s. This online class will focus on the style icons from the end of the Golden Age of Hollywood during the 1960s--such as JEAN SEBERG, ELIZABETH TAYLOR, CATHERINE DENEUVE, and AUDREY HEPBURN. Each presentation includes live video of me discussing the film history, costumes, costume and fashion designers, and fascinating backstories of the stars alongside stills from the movies and images that show the influence on fashion today. The Style Essentials represent iconic costume design in the movies that immediately impacted fashion and continues to influence the industry today. This is a LIVE WEBINAR series of the HISTORY OF FASHION IN FILM course I teach at Woodbury University and in presentations around Southern California. There will be one webinar per decade from the 1920s to the 1970s. This online class will focus on the style icons from the Golden Age of Hollywood during the 1950s--such as ELIZABETH TAYLOR, AUDREY HEPBURN, GRACE KELLY, and MARILYN MONROE. Each presentation includes live video of me discussing the film history, costumes, costume and fashion designers, and fascinating backstories of the stars alongside stills from the movies and images that show the influence on fashion today. The Style Essentials represent iconic costume design in the movies that immediately impacted fashion and continues to influence the industry today. This is a LIVE WEBINAR series of the HISTORY OF FASHION IN FILM course I teach at Woodbury University and in presentations around Southern California. There will be one webinar per decade from the 1920s to the 1970s. This online class will focus on the style icons from the Golden Age of Hollywood during the 1940s--such as KATHARINE HEPBURN, LAUREN BACALL, RITA HAYWORTH, and LANA TURNER. Each presentation includes live video of me discussing the film history, costumes, costume and fashion designers, and fascinating backstories of the stars alongside stills from the movies and images that show the influence on fashion today. The Style Essentials represent iconic costume design in the movies that immediately impacted fashion and continues to influence the industry today. This is a LIVE WEBINAR series of the HISTORY OF FASHION IN FILM course I teach at Woodbury University and in presentations around Southern California. There will be one webinar per decade from the 1920s to the 1970s. This online class will focus on the style icons from the Golden Age of Hollywood during the 1930s--such as MARLENE DIETRICH, JEAN HARLOW, and GINGER ROGERS. Each presentation includes live video of me discussing the film history, costumes, costume and fashion designers, and fascinating backstories of the stars alongside stills from the movies and images that show the influence on fashion today.